Tonight, we bring in the new year and celebrate the conclusion of 2013. In observance of New Year’s Eve, all Battleground Games & Hobbies locations will be closing early this evening at 6:00 PM. 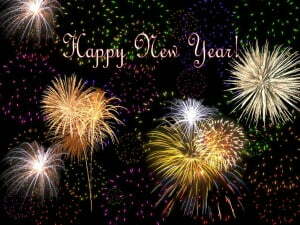 From all of us here at Battleground Games & Hobbies, we would like to wish you all a Happy New Year! Join the Battleground Games & Hobbies community! Please don’t forget to like us on Facebook and follow us on Twitter @battleground_gh! 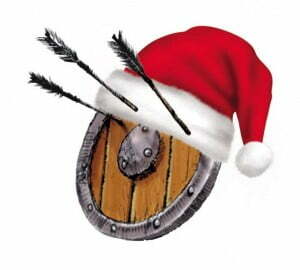 Battleground Games & Hobbies locations are closed today, Wednesday, December 25th, in observance of Christmas. On behalf of the entire staff here at Battleground Games & Hobbies, we would like to wish you all a very happy, merry, and safe holiday! We will reopen tomorrow at noon for our regular business hours. Plus, don’t forget, that tomorrow marks the beginning of the Magical Christmas Weekend Event – a special, weekend-long event that’s not to be missed! We look forward to seeing you there. You can learn more about this special event by checking out our event calendar. Please don’t forget to like us on Facebook and follow us on Twitter (@battleground_gh)! Oh no! It’s Christmas Eve; you didn’t wait until the last minute to finish your shopping, did you? Perhaps you’re still looking for one last perfect holiday gift? No problem – Get Behind the Shield! – we’ve got you covered! 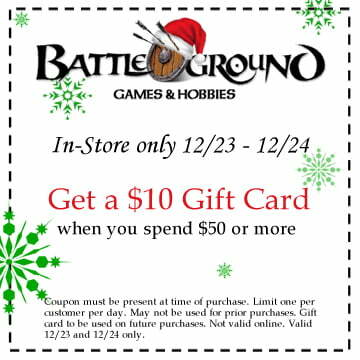 MONDAY & TUESDAY ONLY – take advantage of Battleground Games & Hobbies Last Chance Holiday Sale at all Battleground Games & Hobbies locations! How does it work? Simple: print out either this article in it’s entirety or the coupon below, bring it to your local Battleground Games & Hobbies and pick up that last minute item, all while saving you money. Don’t miss this fantastic last minute opportunity. All you have to do is print this article or show us this article on your mobile device and enjoy the enclosed specials! Coupon must be present at the time of purchase. Limit one per customer, per day. May not be applied toward previous purchases. Gift card to be used for future purchases. Not valid online. Value on 12/23/13 and 12/24/13 ONLY. 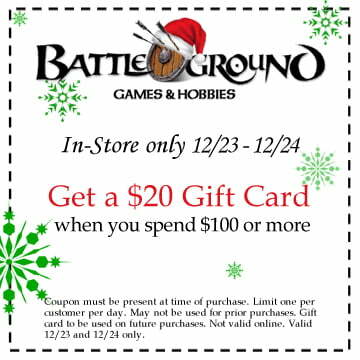 Battleground Games & Hobbies first opened its doors in 2002 and is now one of New England’s premier game stores with two convenient locations – Abington, MA and Plainville, MA. We are fully stocked in all major product lines for the serious gamer and we specialize in collectible card games, board games, miniature games and role-playing games. Our deep stock, great events and friendly, knowledgeable staff make Battleground the top choice for your one-stop, friendly local game store. Get Behind the Shield!